It’s finally here! 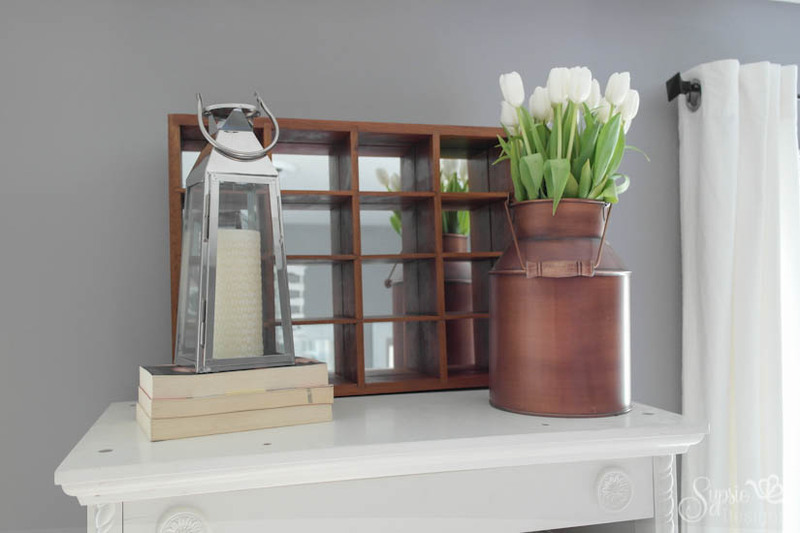 I cannot WAIT to show you the room- I hope you love it! 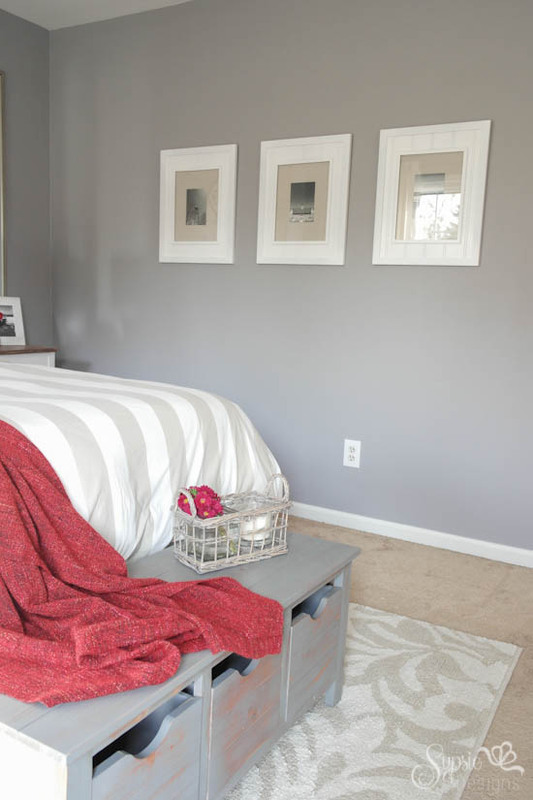 As a refresher, we chose to participate in the One Room Challenge- a 6 week room makeover challenge hosted by Linda at Calling it Home! For the past 5 weeks, 20 design bloggers and over a hundred participants have posted updates on their makeovers, and today is the big reveal day! If this is your first time here, be sure to check out our updates along the way! 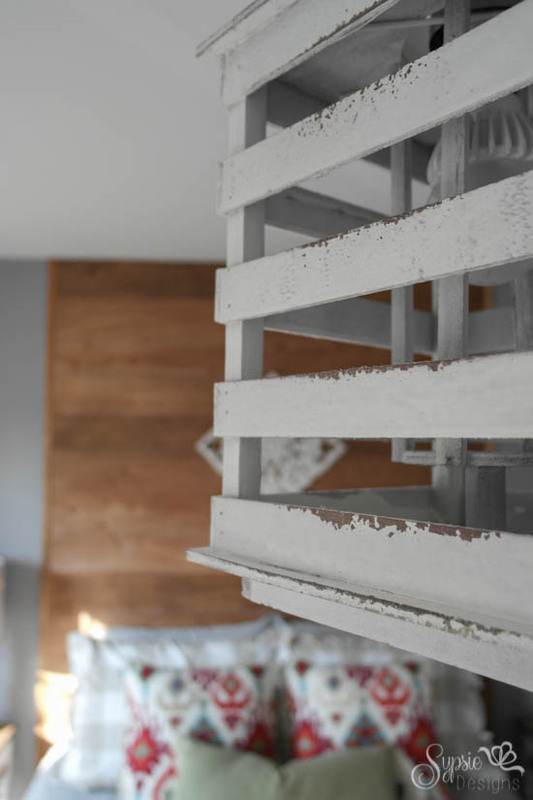 We chose to makeover our guest bedroom, and have had lots of ups and downs. The ups caused us to go a tad over budget, but in the end our room is finished, so mission accomplished : ) Week 1 we talked plans, week 2 we talked mixing paint colors to get the perfect shade, week 3 we talked DIY headboard- on a wall!, week 4 we talked DIY nightstands, and week 5 we gave a huge (and sparkly) excuse as to why we had limited updates! And here we are at week 6. Without boring you completely with too many words, I’ll let the pictures talk for themselves! Originally we planned on building a bench, but after a quick trip to Homegoods, we picked up this amazing option instead! Here’s the castle where Matt proposed : ) I love that this room will always remind me of this! 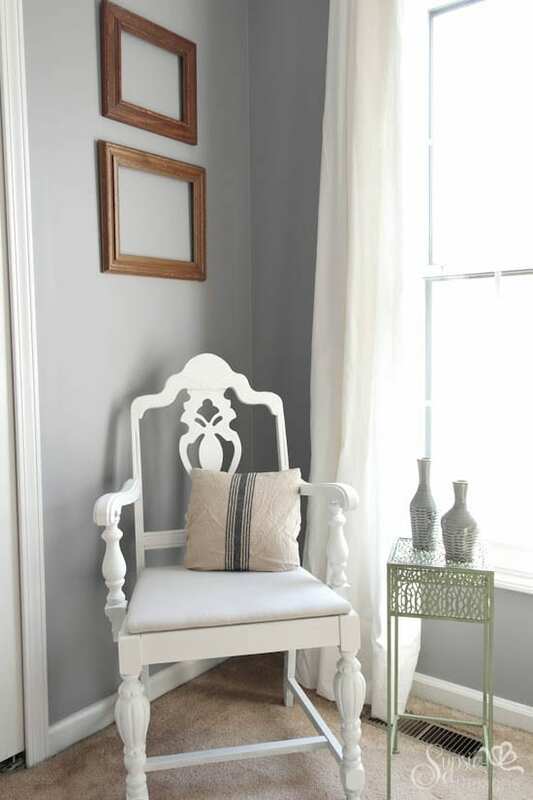 Our $5 garage sale chair got a quick makeover with white chalk paint and a drop cloth covered seat! And that’s a wrap! We’ve had so much fun participating in this ORC, and thanks to Linda at Calling it Home, our guests are now spoiled between our guest bathroom and this room! I’m so happy with how it all came together! Total $379! Not to shabby for an entire room : ) We got creative while shopping around the house, and tried to spend our precious dollars on statement making pieces. What do you think? PS. Want more Sypsie? Follow us by email (top of the right sidebar!) or any of our social pages! Where did you get the mirrors? I love the detail on the edges. Congratulations on getting engaged!!! Now, if you’ll just send me your address, I’ll be happy to move right in to that fabulous room!!! Reminds me of a high-end hotel!!! 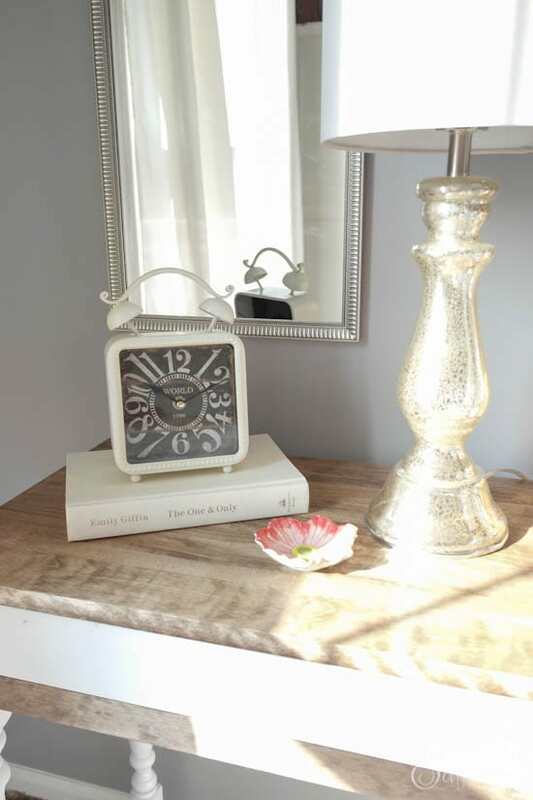 The colors are so calming and the special touches just make it feel like home! 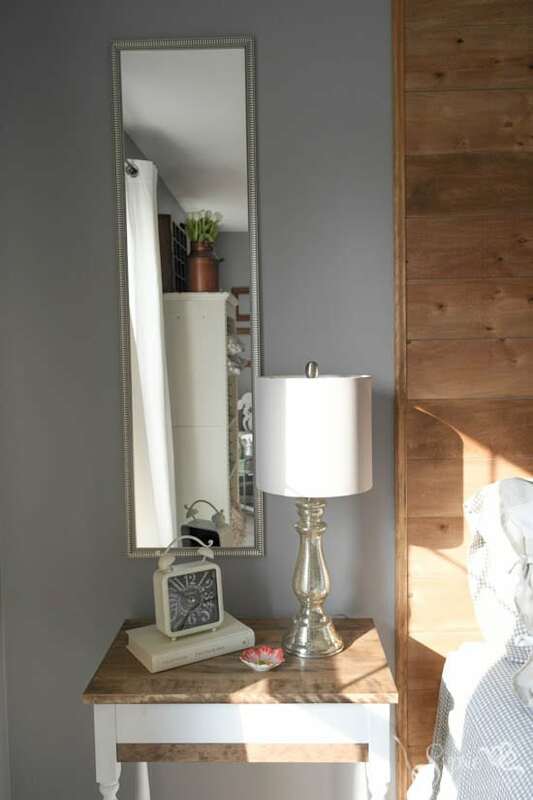 Love the headboard and the light!! You did a great job of making over the chair and the bench at the end of the bed is awesome!!! Your “dust catchers” are minimal and interesting so nothing looks cluttered, it just looks…perfect and ready for it’s magazine close-ups! AMAZING all in itself and especially on that budget! WOW! Aw thank you Mary! We really appreciate it! Beautifully done! I especially love the garage sale chair,and the fact that you accomplished such a beautiful makeover on a buget! What an amazing transformation! A true job well done. I adore the color palette you selected. It feels fresh and fun. The six weeks went by so fast. 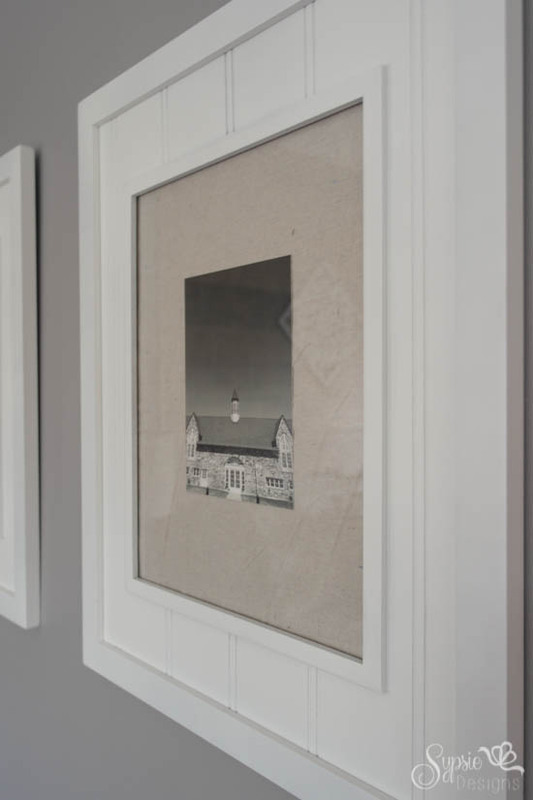 I completed our entry, living and dining areas in a new to us 30 year old house. So, cheers to us! Have a wonderful weekend. Beautiful job! 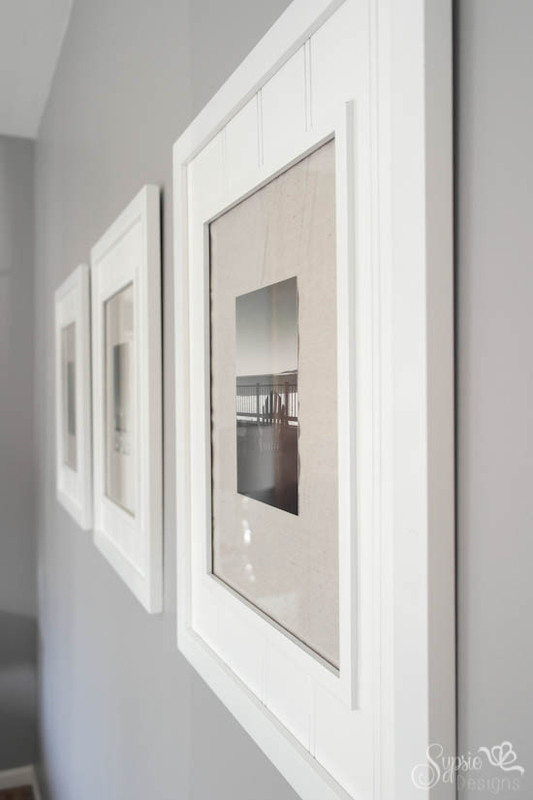 Love the light fixture, and those frames are gorgeous! 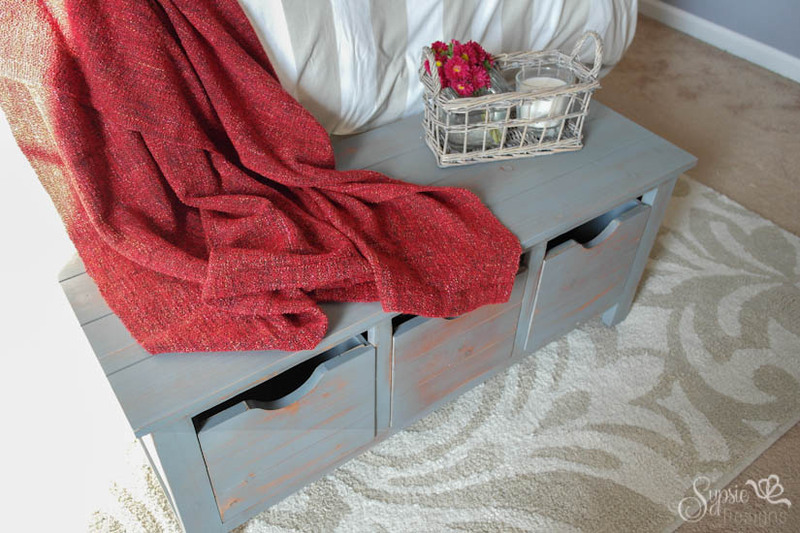 And the bench/cabinet at the end of the bed… love! Thanks Erin! We were bummed we weren’t able to build one like we originally planned, but I think the DIY stars must have aligned when this bench was found hidden under other decor at Homegoods 🙂 Thank you so much for following along- we really appreciate all of the love! I love the transformation, it looks amazing! Thanks Katy 🙂 We’re so happy with how it came together! So beautiful! It looks like such a cozy and relaxing space filled with character and charm. Love it – and the budget too! Thanks Katie 🙂 We can’t wait to have guests over now! Thanks Traci! Love that description! What a great room! So peaceful and pretty!! This room turned out lovely! 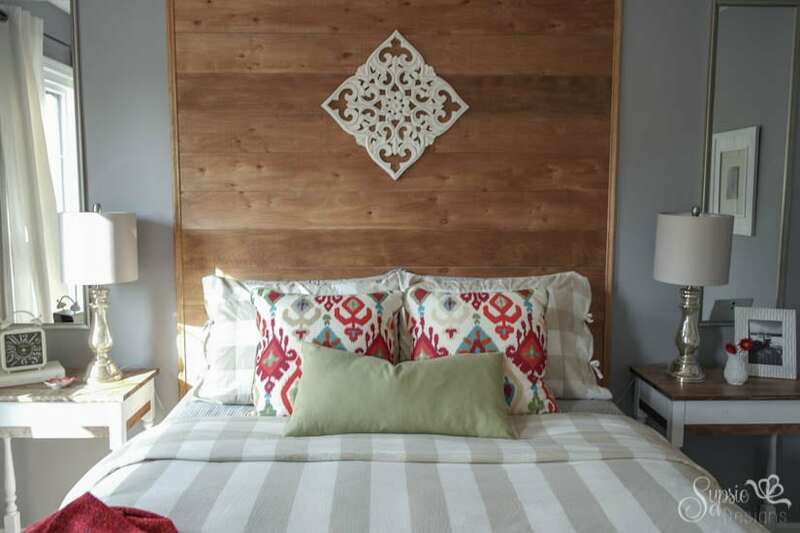 I really like the headboard wall! Katie@Upcycled Treasures nailed it. Character and Charm. It’s perfect! It’s been so much fun participating in this challenge and seeing all the progress. Love this one! 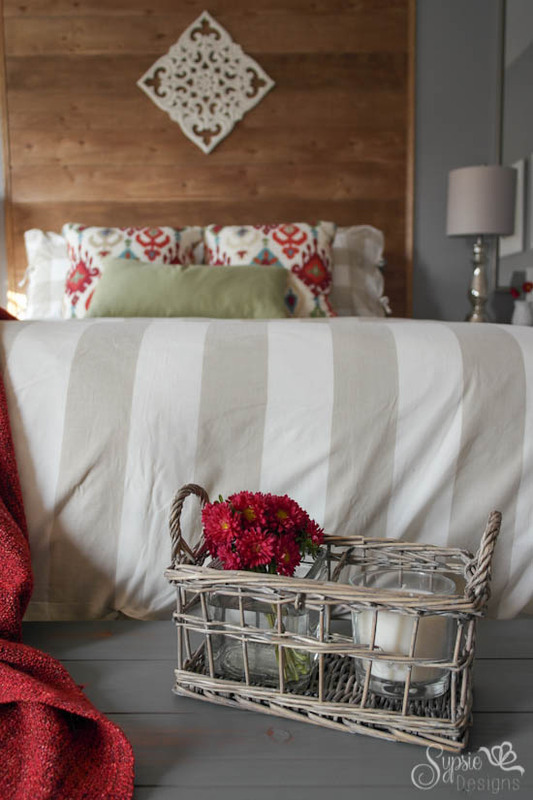 You statement wall behind the bed is just absolutely fantastic! The room is so relaxing, inviting,and oh-so-pretty!!!! Thanks Vel! That’s exactly what we were hoping to create! Such a pretty room. 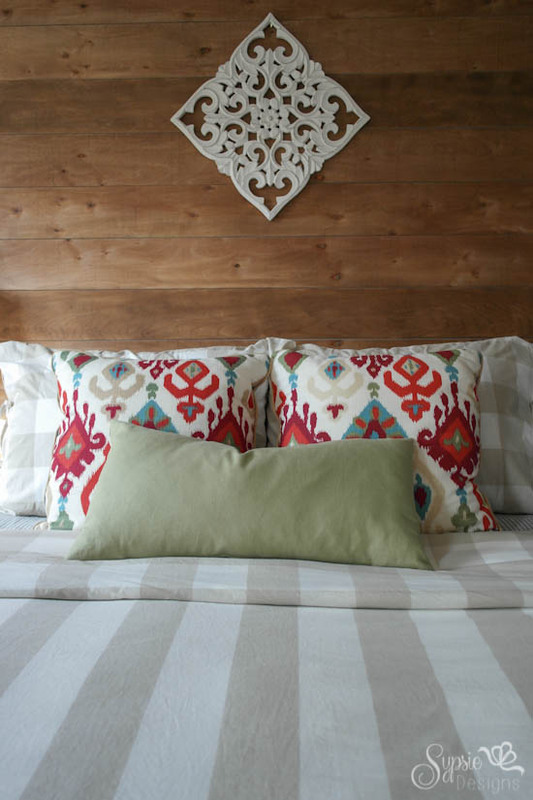 I love the paneled wall, and also how the artwork above the bed mimics the ikat print in the pillows. Great transformation :-). Thanks Delia 🙂 The artwork was a last minute grab while in the checkout line at Homegoods haha- funny how things pop up sometimes! 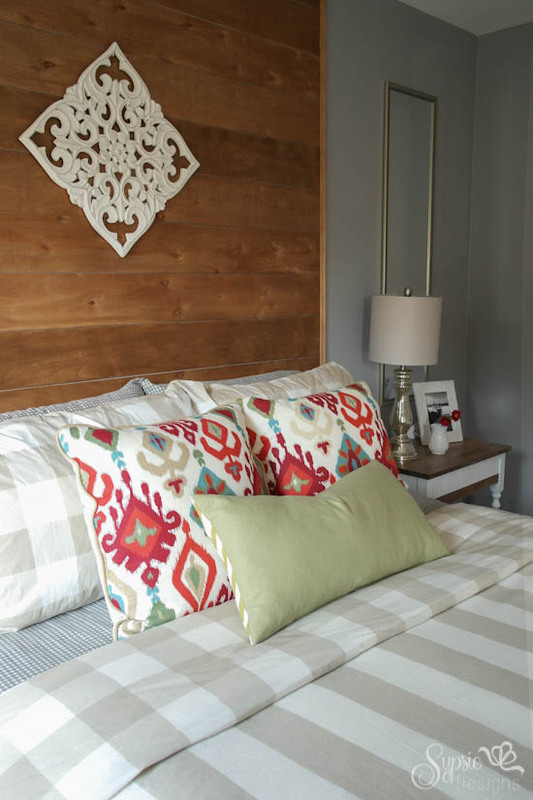 The headboard looks amazing, especially with the grey walls! 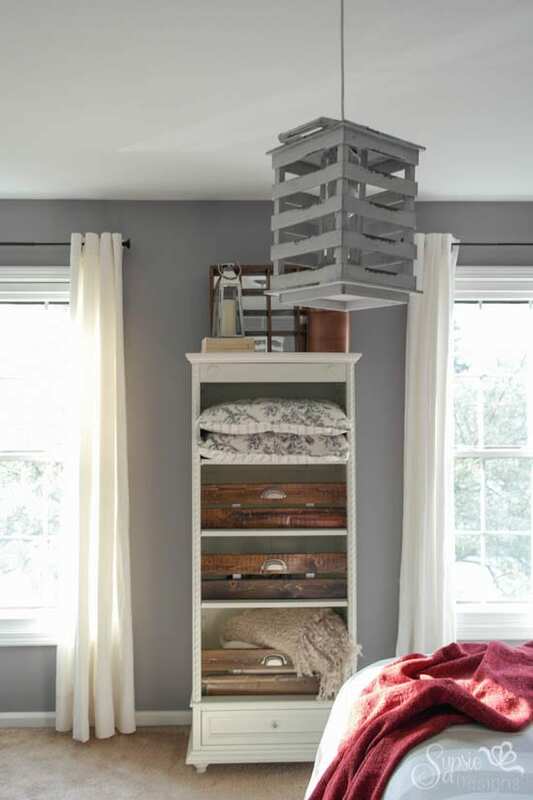 And I love the pendant light! Thanks Kevin! I really appreciate it! This looks great! So welcoming. 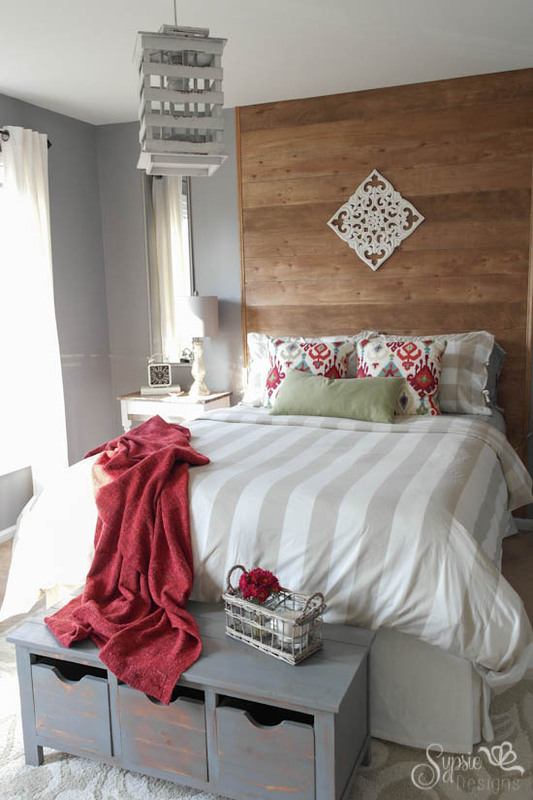 I love the accent wall/headboard with the bedding and the shelving. It all looks wonderful! Oh your lucky guests! Congrats on a beautiful ORC room, and most of all, congrats on your engagement! Thanks Angela 🙂 I could not be happier! I love this guest room. 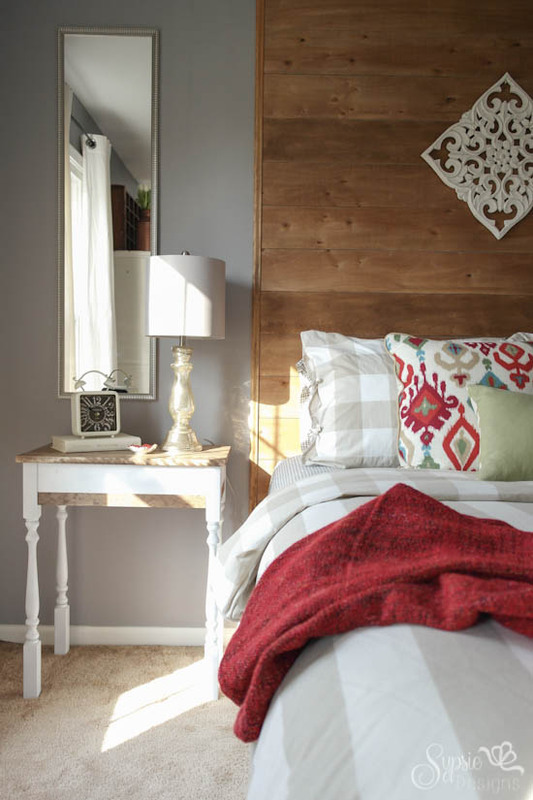 That plank wall is fantastic, and the color you selected are inviting and warm. Have fun planning a wedding. Everyone loves a wedding! Thanks so much Linda! We had so much fun again- thank you for hosting this amazing challenge!! 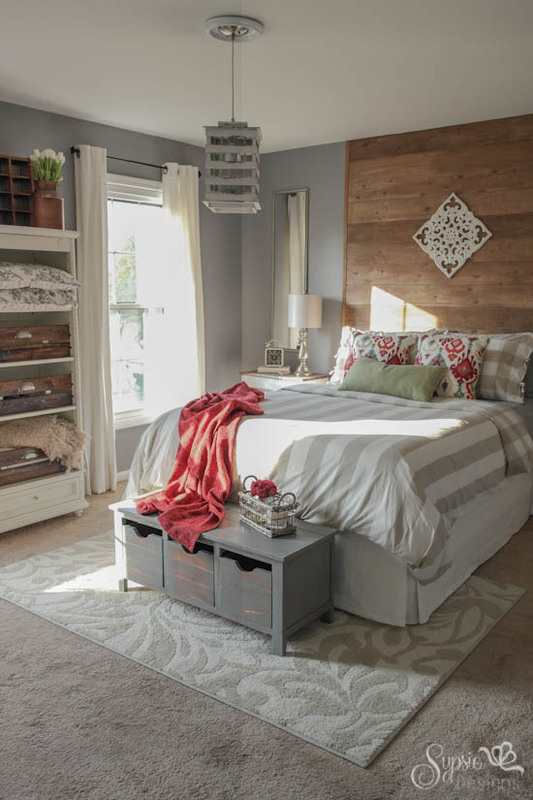 That plank wall is perfect … beautifully done and on an incredible budget! 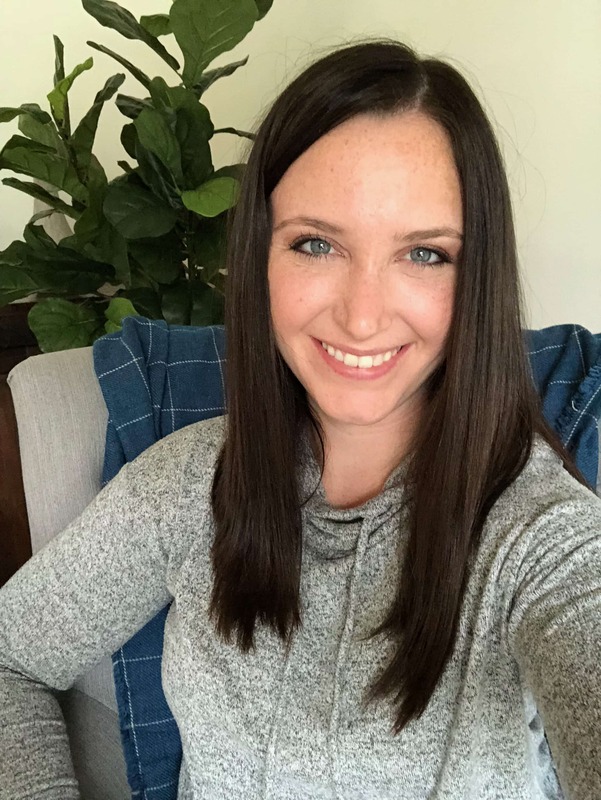 Congrats on your engagement and a room done! Beautiful! 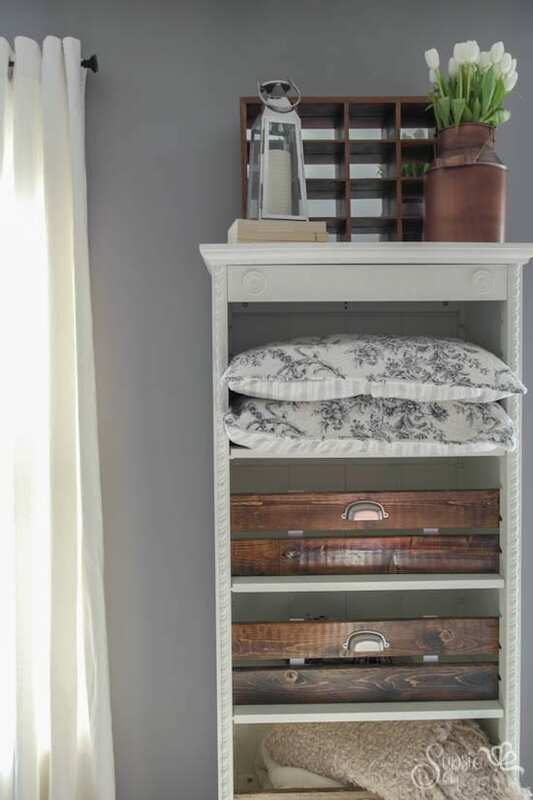 Love all of the neutral colors with just a little bit of color thrown in. 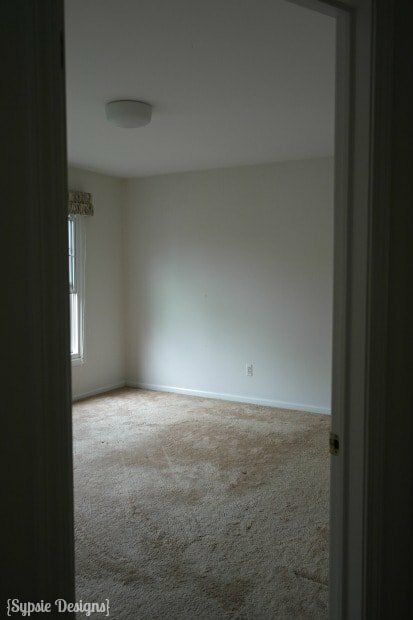 You did a great job pulling this space together! Thank you Sherry! We really appreciate it! Loving the bright pillows Jodie! Where are they from? Great job with the room! It looks awesome! Beautiful! 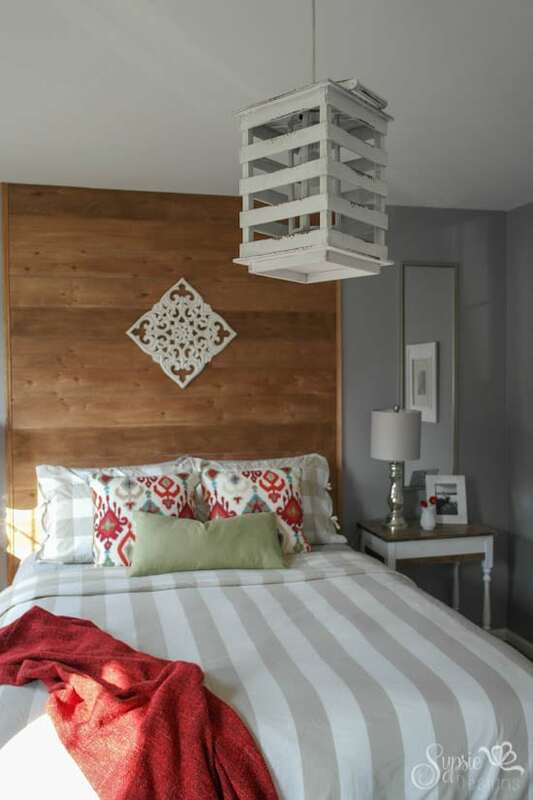 Love your wood headboard wall and the smart lantern light fixture. Nice job! Came from Remodelaholic.. Fantastic room makeover, best I have seem in a long time. You asked what we think. I would have eliminated the most expensive item on your list, bringing the price of the makeover way down. The bench at the end of the bed, it looks too small to me and a big chunk of change. Amazing job you two, love all the rustic elements. Love it! Now you can come and do my house! I love the art on the headboard. Where did you get that?